Rain is very rare in Phoenix. It usually is a time that people in other parts of the country think we are crazy! We run outside, take photos, run in puddles and simply enjoy the rain. Phoenix is sunny 360 days out of the year and we only get 6 to 7 inches of rain a year. We normally don’t get more than 6 days of rain in an entire year. Because of this, rain is a real rare treat to us! However this rain can also cause hazards on the road! Avoid underpasses and washes when it rains, flash flooding is dangerous! During the summer months in Phoenix we get what is called our Monsoon Season. This season can involve rain, dust and strong winds! I have asked my friend and Meteorologist Royal Norman for AZFamily 3TV a few questions to help explain our Monsoon season to you. The monsoon lasts from June 15th to September 30th. About ten years ago, the National Weather Service decided to set actual dates for the season. Before that, we used to watch dew points, which is a measure of moisture in the atmosphere. Back in the day, when we had three straight days of average dew points of 55 or more, the monsoon was deemed to have “started.” By that method, the monsoon “started” in Phoenix this year on June 27th. I think the weather service wanted dates because the season really changes for the entire state, not just Phoenix. For most of the year, our weather comes from the west. We’re under the influence of the jet stream which brings us storms now and then. In the summer, that jet stream shifts well to the north of the U.S., mainly because of summer time heating, and allows moisture to come into Arizona from the south and southeast. This seasonal shift of wind is the actual definition of the monsoon. We’ve all heard of the Indian Monsoon in Asia, but there are a total of 8 monsoons identified around the world. The North American Monsoon, (ours) is one of those. A haboob is a dust storm but some dust storms aren’t haboobs. I’m kind of an old-schooler on that. I just call them dust storms. But about 20 years ago, a local TV guy figured out our dust storms can look a lot like similar sand storms in the Sudan of the Middle East. He started using it and it got in the paper and it stuck. However, a haboob is a specific kind of dust storm that mores along the outflow from a powerful thunderstorm. 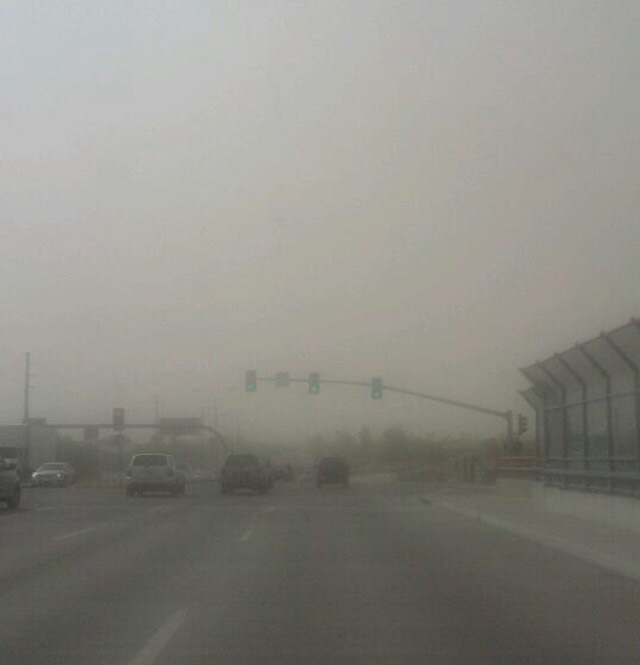 We can get dust storms a whole bunch of other ways, but those aren’t haboobs. Now you know why I stick to dust storms. It’s easier to understand. A microburst occurs in perhaps one or five thunderstorms. A microburst is a strong, localized downburst, something that occurs in virtually every thunderstorms. When thunderstorms build, they push moisture into the upper atmosphere. Eventually, when the storm ends, it collapses and cold air rushes downward to the ground. A microburst is a very intense and very localized downburst that usually is less than 1-2 miles across and can contain winds up to 120 mph. If an area of damage is much bigger than that, which we’ve seen, it is called a downburst or macroburst. These summer monsoon rain storms can be dangerous. During the monsoon, or summer thunderstorm season, Arizona experiences more severe weather than many other states. On some occasions, a severe storm may spawn a microburst. More often, high winds, dust and severe downpours result in flash floods. Flash floods can occur and be dangerous to drivers, hikers, and people near washes. A good rule of thumb is NEVER drive into a wash when rain/weather is expected. Washes can fill up unexpectedly and people have been trapped in the raging water and taken away. This is very dangerous for the motorist and the rescue squad. Please take a moment to look at this dramatic video of a minivan rescue from a flooded wash. WATCH THIS VIDEO The important thing to remember is NEVER enter a wash when it is raining. Never enter a flooded area. “Do not enter wash when flooded” means just that! Be safe during the monsoon season! TURN OFF ALL YOUR LIGHTS including emergency flashers. You don’t want a vehicle behind you to think your lights are a guide and possible end up hitting you. So remember to say safe out there during the Monsoon Season! Drive carefully! PULL ASIDE – STAY ALIVE! I would like to thank meteorologist Royal Normal Chief Meteorologist at KTVK for his weather knowledge in helping me with this blog. I would also like to thank Betsy Leader of the Leader Law Firm in Tucson for directing me to some wonderful websites. I would also love to hear your storm driving stories and let me know what kind of driving tips you would like to learn next. Leave a comment below at the bottom of the page and I will respond to you.